Welcome to the thread about Tribe Xit-Xaht! In this thread I'll inform you about a new Roleplaying guild for the[ pc/eu] megaserver. - Adventureous & Active Roleplay. What we mean with this is a Roleplay scenario that has more action in it, like retrieving old relics and artifacts from someone or somewhere. Fighting off invaders that tend to bring harm to our swamps and kinsman (Including other Saxhleel). 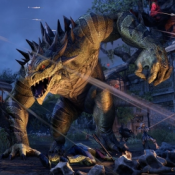 Or having certain rituals that our tribe performs to become more powerfull, we came up with an idea that we would look closer on Argonian Behemoths so that is something we will make a topic in the future. Our tribe will of course, also have casual Roleplay. - Tribe Xit-Xaht? The Xit-Xaht tribe was an Argonian tribe that resided in the northwestern parts of Shadowfen in a ruin called Mazzatun. The original tribe started performing rituals that eventually included offering other Saxhleels aswell which some of our tribesmen were against and got exiled from the tribe. After this the Xit-Xaht's got attacked by a tribe by the name of Su-Zahleel and a couple of mercernaries. The Xit-Xaht's roamed the swamps alone or in small groups, but after a year the remaining Xit-Xaht's would hold a meeting in a new ruin which they would call Mazzathor and re-assemble the new Xit-Xaht tribe. - Idealogy & How we look on life: The current Xit-Xaht tribe is less cruel than the first Xit-Xaht tribe of Mazzatun. The current one tends to only sacrifice people towards their Hist if they are not innocent. The main sacrifice is the heart of wild animals that dwell the swamps, but it is not rare that a Dunmer or other foreign invader of Argonia has been sacrificed towards the Hist of Mazzathor. Our current tribe care about their Saxhleel kinsmen but shall have no real compassion for the weak-minded tribes that fall towards random sellswords and bandits. Our tribe has a bit of a lust of power but this will not give them a mindset that they see themself as the most superiors or make us very arrogant. - We also have our own Xanmeer (Argonian Pyramid) as our house! We built a Xanmeer at the Stay-Moist Mansion. We Roleplay there since it is our main hall. But the Hatching Pools which is located right next to it is also a part of our Stronghold. IC (In Character) it is located somewhere else in Argonia and not the 'actual' Hatching Pools of Shadowfen. - Mature Attitude, altough we like to have fun and have a laugh we also require people to be serious in Roleplay. So OOC (Out Of Character) we don't mind a less 'serious' attitude but we really want people to be mature and serious about Roleplay. - An Argonian Character, this should not be a surprise for an Argonian guild. But if you really want to Roleplay as a different race or have a plot that could include this tribe than we should be interested in what you have in mind. 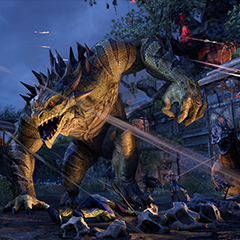 - A decent amount of knowledge about the Argonian lore, we prefer to have people that understand that we are talking about so we won't have to explain everything. But not knowing everything is not a problem. - A small backstory on your character that you will bring to the tribe, this is usefull to see if your character fits our tribe. Xar-Sethor is a leader that would welcomes any Saxhleels that are willing to join the tribe, he tends to be merciless to those who have shown weakness or brought terror to the Saxhleel and the swamps of Argonia. He's not a cruel leader and values the life of his tribesmen and other Saxhleels. Xar also has a lust for power and would seek ways to strenghten Tribe Xit-Xaht. Xar-Sethor was one of the Saxhleel that got influenced by Amber-plasm. Xar-Sethor is also slightly experienced with the Stoneshifting magic practised by Tribe Xit-Xaht, Xar has been able to use fire magic and even breath it. He's also an experienced swordsman and caries his sword and shield with him. You can contact us on the [pc/eu] megaserver by sending a mail to @Khayun or add him to your friends. When he is online he should be able to invite you into our tribe. But plenty of people who already have 5 guildslots filled can join our Discord which is no problem at all! Thanks for reading our thread! We hope to see you in our Discord/Guild, or any feedback regarding this tribe is also very pleasing to hear! Have a good day.